Women are shaping and influencing Ribera del Duero and Rueda’s wine industry in greater numbers than ever before. From oenologists making world-class wines to CEOs and leaders running the show, women today play a pivotal role in creating Ribera and Rueda wines loved the world over. In celebration of Women’s History Month, we’re sharing a snapshot of these industry trailblazers. 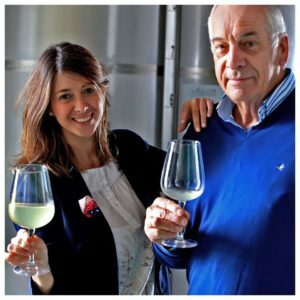 Read on to learn more about oenologists Alicia Vidal Soblechero at Bodegas Soblechero and Victoria Pariente at Bodegas José Pariente. We also feature executives Carmen San Martin, president of Consejo Regulador, D.O. Rueda, Almudena Alberca Martin MW at Grupo Bodegas Palacio, Noelia Mena at Vinos de La Luz, Ángela Lorenzo Heras at Bodegas Félix Lorenzo Cachazo S.L. and Amaya Taller at Restaurant Taller. San Martin is a member of the Gutiérrez family, proprietors of Bodegas Hijos de Alberto Gutiérrez for four generations, carrying on a rich history that dates back to the 17th century. Currently she serves as the first president of CRDO Rueda. What accomplishments are you most proud of in your role as President of D.O. Rueda? San Martin: “The most important thing since the start of my presidency is to create a stronger community and consensus. The Regulatory Council is the home of 1,700 partners with many different interests. We have to work with them all. What do you see as opportunities (or challenges) for women working in the wine business in Spain? The Soblechero family has been cultivating grapes in Rueda for centuries in the La Seca area, characterized by its uniquely rocky soil and wines with a rich, fruity expression. They produce Viña Clavidor. Alicia Vidal Soblechero is one of Rueda’s first female vineyard managers. What is your family’s philosophy for making wine? Your family embraces traditional methods in the vineyards, yet you also have some notable innovations. Give us an example of something traditional and also something innovative. José Pariente grew grapes for decades in Rueda. In 1998, Victoria, his daughter, established Bodegas José Pariente to make the family’s first commercial wines, opening a state-of-the-art facility between Rueda and La Seca. Tell us about your wines. Would you share one of your favorite combinations of wine and food using your wine as an example? Do you feel the wine industry in Spain has opened its doors to more career opportunities for women? Almudena Alberca Martin is the first woman to achieve the Master of Wine title in Spain. 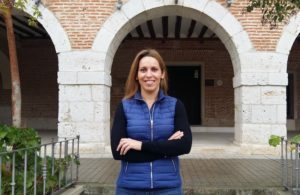 Technical Director at Bodegas Viña Mayor since 2015, she has been responsible for repositioning the winery and creating and/or relaunching new wines. 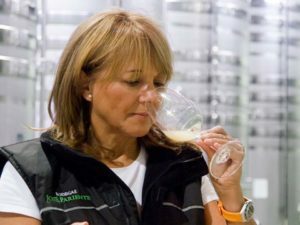 What does it mean to be the first female Master of Wine in Spain? What is a non-traditional pairing with food that you recommend and why? Noelia Mena is Technical Director for Vinos de La Luz, a family company that carries on a generational legacy of global wine-making. It comprises a group of wineries in Spain, Italy and Argentina, including Pagos de Valcerracín and Valpinica in Ribera del Duero. Tell us about your Spanish wines. Mena: “A wine of ours – to carry the common logo that identifies it with Vinos de La Luz – must be of a very good level. La Luz del Duero is in Peñafiel, the heart of the D.O. Ribera del Duero. We focus on making 100 percent Tempranillo wines sourced from different types of soil and aged only in French oak. They have a great predominance of fruit and balance with soft tannins. Give us an example of a food pairing. 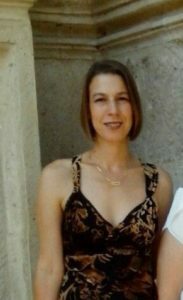 Ángela Lorenzo Heras, Technical Director, Bodegas Félix Lorenzo Cachazo S.L. Lorenzo Heras’s father Félix Cachazo was one of eight winemakers who help co-found the D.O. Rueda and champion the Verdejo varietal. Today, Rueda wines are among the most widely consumed in Spain. Why is Verdejo, the dominant grape in Rueda, so adaptable to this region? You work with very old pre-phylloxera vines. What is the average age? What do you think are the opportunities and the challenges for women in the wine industry in Spain? Could you share your favorite wine and food to pair with it? Bodegas Arzuaga’s Restaurant Taller, in Ribera del Duero, offers an avant-garde Castilian cuisine by celebrated Chef Victor Gutiérrez (with a Michelin star). Amaya Taller oversees the restaurant, the property’s five-star spa and wine tourism. Tell us about Restaurant Taller’s wine program. What are some of the restaurant’s signature dishes that would pair well with Rueda and Ribera wines? How easy or difficult has it been for you to succeed as a female restaurateur in Spain? 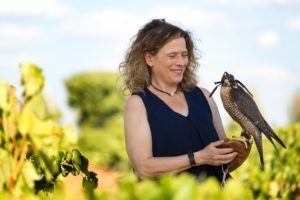 The global wine industry is making strides in achieving greater gender balance, and these successful women all have a “glass half full” positive attitude about the future. More importantly, they are seizing that glass – along with opportunities to make their mark.